Sakaguchi utilizes the latest production machinary to deliver products with quality second to none. We are well-equiped with a full-range of testing and inspection equipment to ensure your satisfaction. We apply thoughtful packaging methods and materials to our products. 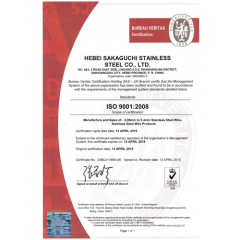 Hebei Sakaguchi Stainless Steel Co.,Ltd. HEBEI SAKAGUCHI STAINLESS STEEL CO.,LTD is a dedicated stainless steel wire and wire product manufacturer located in the Lingang E.D.Z Shanhaiguan District, Qinhuangdao City of the Hebei Province. 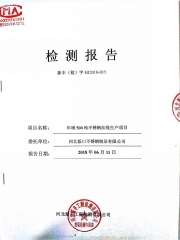 With many praises received from our customers as well as from within the industry, Sakaguchi is one of the landmarks in the Chinese stainless steel wire industry. 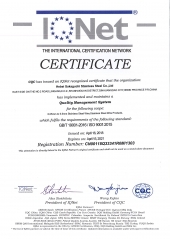 We are certified to ISO 9001:2008 and execute JIS standard during operation. With solid technical strength, scientific manufacturing process and strict quality-control system, Sakaguchi only selects the best raw materials from all over the world and turns them into a wide variety of high quality stainless steel products. Over the years, Sakaguchi has made use of advanced production and testing machineries, while acquiring world-class talents to continuously improve our product quality and optimize our level of service. Our product includes SS wires in a variety of grades, sizes, strengths, surface finishes, coating, and packages to suit your usage. We also offer a range of wire-products, including knitted mesh, woven mesh, compressed mesh pads/gaskets, baskets as well as filter discs. Please refer to our product page to find out more. Qinhuangdao City, Hebei Province, P.R.CHINA. Sakaguchi ERP system is online!